The Western Mindanao State University College of Forestry and Environmental Studies (WMSU-CFES), in partnership with the Philippine Network of Educators on Environment (PNEE) and the Commission on Higher Education (CHED) spearheaded a training-workshop on Mainstreaming Climate Resilience and Green Growth in the Environmental Education Programs of Higher Educational Institutions last May 16-18, 2017 at the Grand Astoria Hotel, this city. The workshop, which was participated in by over 40 enthusiasts from different higher educational institutions (HEIs), aimed to educate the participants on the framework of mainstreaming the concepts of climate resilience and green growth in the academic programs, specifically in instruction, research, and extension. It is also directed to enhance the abilities of the participants to apply key technical and science-based climate change analytical tools and methodologies that are used in climate resiliency and green growth planning, and to capacitate them to guide and train staff of their institutions and other clientele on the principles of climate resilience and green growth planning enriched in their academic programs. PNEE, to which WMSU is a member since 1991, supports and promotes the initiative of the Climate Change Commission (CCC) especially in implementing training and capacity development programs to strengthen institutional capacities in developing local Communities for Resilience (CORE) Program that focuses in technical and science-based disaster risk and vulnerability evaluation, and replicating best practices in implementing resilience plans. The CORE Program’s main objective is to transfer knowledge and capacity to national and regional government agencies, and partner agencies. Dr. Andrew Eusebio Tan, PNEE President and also President of Carlos Hilado Memorial State College (CHMSC) in Talisay, Negros Occidental, emphasized the importance of knowledge and capacity development because it will enhance the knowledge of science on climate change, which will aid in developing the capacity of institutions and communities for climate change adaptation, mitigation and disaster risk reduction and management. “This will target the establishment of climate change knowledge management accessible to all sectors at the local and national levels,” Dr. Tan said. With its 81 member-institutions and 33 individual members from different parts of the country, PNEE is at a vantage point to strengthen and facilitate capacity building for local adaptation planning, implementation and monitoring of climate initiatives especially in vulnerable communities and areas. Dr. Nicomedes D. Briones, retired faculty member of the University of the Philippines Los Baños- School of Environmental Science and Management (UPLB-SESAM) discussed the different laws, policies and guidelines on climate resilience and green growth. He emphasized the importance of integrating these policies to better develop programs concerning climate resilience and public awareness in the country. Dr. Nestor Castro, Vice Chancellor for Community Affairs of the University of the Philippines-Diliman gave a thorough discussion on the initial draft of the Environmental Education Framework. Another key speaker was Dr. Bernardita Quevedo of the Surigao Del Sure State University, who spearheaded the workshop on integrating key concepts in the academic programs of PNEE member-institutions. 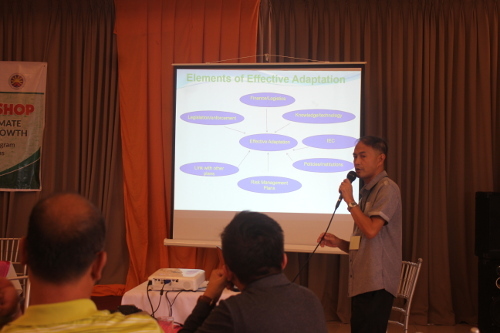 WMSU-CFES Dean Dr. Fredelino M. San Juan also gave a discussion on Adaptation and Mitigation Measures. Several key concepts were also discussed during the workshop, including national resource assessment and socio-economic components of climate resilience and green growth planning; vulnerability analysis; and, environment and natural resources accounting.